Nike Kobe Venomenon 5 ? Nike brought the Venomenon series over to U.S. consumers for the first time with their 4th version of the popular outdoor model and we may have a look at the 5th version. Nothing is confirmed at this point but the shoes pictured are definitely a Kobe team model. I know there are two Kobe team shoes but the only one I can actually remember right now is the Venomenon series, its also the most popular of his team shoes so I am just assuming these are part of that line. If this is true then they’ll be outdoor specific and it looks like we may see Lunarlon for the cushion setup – judging by the molded shape of the midsole. Check out the image below and feel free to speculate further. The only thing that is confirmed is that this is not the Kobe 10. Is it that kobe mentality? 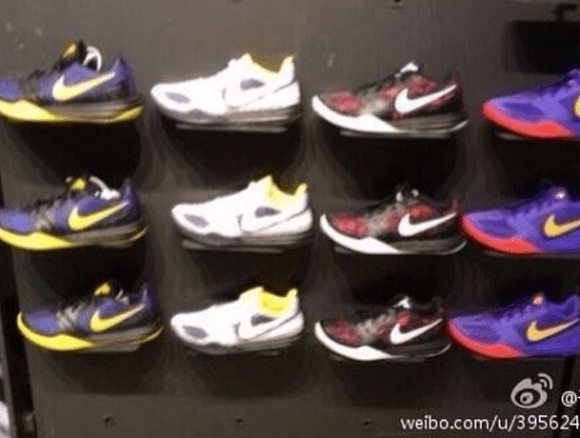 in the original picture from weocia on instagram, it looks like there are more shoes above the headline “KOBE X”. i hope that means we get a reveal of the 10th shoe soon, but then again, maybe it’s too soon to hope for that.